There is a striking relevance to the life of the average American teenager in “Stuck in Love,” a dramatic comedy starring previous Nickelodeon star Nat Wolff and the always adorable Logan Lerman. Wolff stars as Rusty Borgens, an innocent, lovable, hopeless romantic and son of veteran novelist Bill Borgens, who is played by Academy Award nominee Greg Kinnear. The writing in this movie is incredible and is paired with a fabulous casting and scarily accurate depiction of high school and life in general. “Stuck in Love” is a must see for all teenagers. Josh Boone did an absolutely outstanding job directing and writing this film, which makes it impossible for me to believe that this is the first movie he ever directed. I’m partially convinced that Boone wrote these characters and their dialogue purposefully to make me fall in love with them. By far the most interesting character in the film is Borgens’ 19-year-old daughter, Samantha, played by Lily Collins. A cynical, intelligent and tremendously independent young girl, Samantha Borgens takes after her father and because of this, she resents her mother for divorcing him the previous year. Unlike her brother, she doesn’t believe in love and feels that “life is only as meaningful as we fool ourselves into thinking it is.” That is, until she meets Lerman’s character, Lou. Both Samantha and Rusty take after their father as writers, which make their dialogue in the movie all the more fascinating. The movie immediately hooks you with Rusty’s opening description of a girl he so desperately admires: “I remember that it hurt; looking at her hurt.” My favorite scene in the film, besides every other scene in the film, is when Rusty has to read an original poem to his English class. The poem is so brilliant and heartfelt that it makes me wonder if Josh Boone is actually a professional poet when not directing and screenwriting. Rusty’s crush, Kate, is a popular and sweet girl but it is revealed that she is hiding a secret far more than what he could imagine, but being the understanding and beautiful human being he is, inside and out, he loves her anyway. Wolff’s character is the perfect underdog: intelligent, innocent and charming. His character has a lot in common with Lerman’s character, Lou, in the fact that they’re both writers and both romantics. The casting in this movie is spot on, especially Lou’s character. Logan Lerman previously starred in “The Perks of Being a Wallflower,” where he played a similar character to Lou; an endearing writer with strong emotions. Lerman knows how to play the smart and charismatic guy and this movie would not be nearly as entertaining without his character. Rusty and Kate are pretty typical high school students: Rusty a quiet and observant boy, and Kate a cute and admired girl. The way that Boone portrays high school in this film is beyond precise, which is something one doesn’t typically see in a movie. The scene where Rusty has to read an original poem to his English class is essentially the most relatable scene in the movie for high school students. When Rusty gets up in front of the class to read his poem, he casually tells his teacher, while the rest of the class giggles, that making him read his poem aloud to the class is humiliating and a violation of privacy. He starts to read his poem then stops and says, “This is so awkward,” and restarts. Every single high school student can relate to the awkwardness of speaking in front of the class alone. The teenagers who watch this movie, which should be everyone, will see this scene and feel for Rusty and know exactly what he is going through because they’ve all been there. 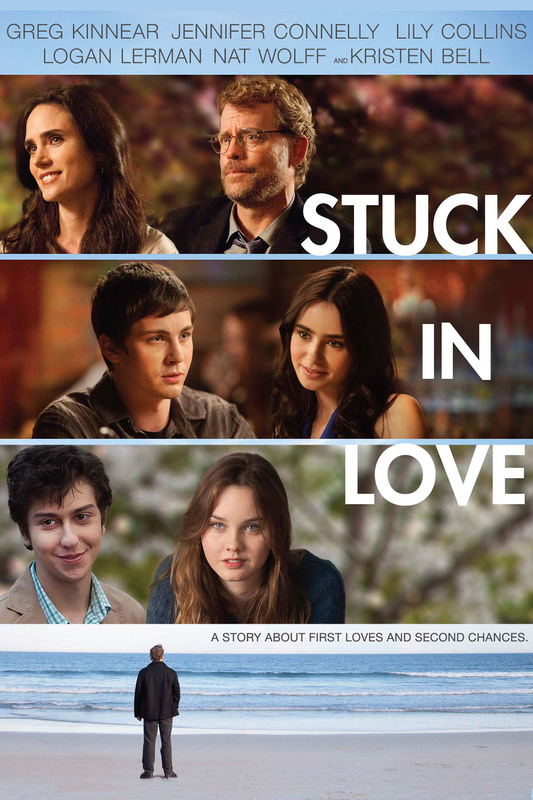 “Stuck in Love” covers many relevant aspects of life, focusing on the complexities of love and growing up into unique individuals. The actors and actresses who play these characters are perfect for their roles, and with that said, the characters and their dialogue are exceptionally well written. All teenagers should watch this movie because I can guarantee there is something relatable to their lives in it, and if there isn’t for whatever strange reason, they’ll love it anyway.